You just never know when a cowboy is going to pop up. Let's take the 1980 film “Cruising” as an example: Set entirely in New York's gay leather underground, in which everybody is sort of dressed like a 1950s street gang member, but with studs and pocket hankies, there is a completely unexpected cowboy cameo, of a sort. Star Al Pacino, who is undercover investigating a series of murders, gets arrested and interrogated by the police. Unhappy with his answers, they open a door, and an enormous African-American man, dressed only in a black jockstrap and a black cowboy hat, walks in the room and belts Pacino, then leaves again. Why is he a cowboy? Why is he almost naked? Why is he African-American? These questions are never answered, and perhaps that's for the nest, as the cowboy is a lonely, mysterious character, even when abusing prisoners in the East Village. Here are several more examples of cowboys that show up in unexpected places. The Texan Quincey Morris is often left out of adaptations of Bram Stoker’s “Dracula,” although he makes a bit of an appearance in the Francis Ford Coppola version of the story, played by Billy Campbell. The film is so deranged, however, that it is possible to forget the presence of a gunslinging American in it, so people not familiar with the original novel might be surprised that a Bowie knife-wielding cowboy battles Dracula. Morris calls himself a teller of tall tales, but one of his tales is true: He had a run-in with a vampire in Texas that cost the life of his horse. 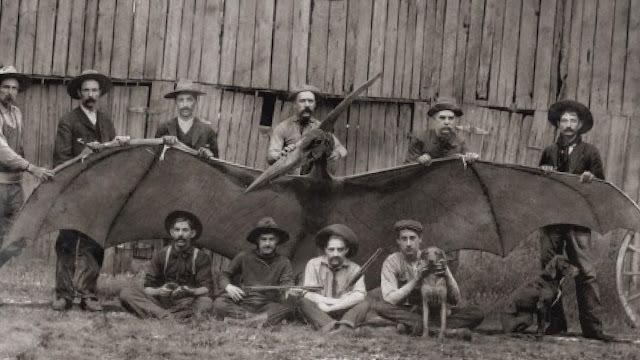 That’s right: Bram Stoker’s “Dracula” was the original Weird Western. It isn't really too strange to have a cowboy on a children's show — after all, Buffalo Bob Smith, host of the Howdy Doody Show, was a cowboy. But there haven't really been many cowboys like Cowboy Curtis from Pee Wee's Playhouse. Some of it has to do with the casting of Laurence Fishburn, an actor who is probably best known for playing smart, somewhat menacing characters, but here playing a wide-eyed, aw-shucksing, knee-slapping cowpoke. But there was more to Cowboy Curtis that seemed a little odd, which is hardly surprising, given that the whole show was shot through with a sort of a low-burning camp sensibility. So Cowboy Curtis has his hair in Jheri curls, and favors satin outfits, and, during a sleepover episode, requests cowboy-themed pajamas from the Playhouse's resident genie, producing this unforgettable spell: "Spirits of the tumbleweed, help our cowboy friend in need! See him fitted tight in PJ's that are outta sight!" It's sort of a narrative tradition to have a character who doesn't know anything — it provides an excuse for explaining plot elements, or backstories, or exposition, or whatever information the audience needs. However, 1984's “The Adventures of Buckaroo Banzai” behaved exactly as though it were a late film in a rather protracted pulp series, and even though there was a character who knew nothing — Jeff Goldblum — the remainder of the cast often refused to explain anything to him. This is most notable when Goldblum discovers a watermelon trapped between two enormous pressure plates in Banzai's headquarters. "Why is there a watermelon there?" he asks. "I'll tell you later," is the only answer he, or anybody, ever gets. Goldblum plays a neurosurgeon named New Jersey who joins Buckaroo Banzai's gang, the Hong Kong Cavaliers. But, for whatever reason, when Goldblum shows up for work, he's duded out as a cowboy. Appropriately, he refuses to explain. David Lynch intended Mulholland Drive to be a television series, but, when that fell apart, he went in and rescripted what he had, reshot some scenes, and wrote a conclusion that not only feels like it's the end to another film, it actually is, with his main characters abandoning their earlier identities to forge a new conclusion. So there are a lot of little scenes in the film that were perhaps once meant to become longer stories, but are, instead, now merely short moments of impenetrable weirdness, contributing to an overarching mood, rather than any specific storyline. One of the threads that gets lost is that of director Justin Theroux, who is being bullied by mobsters to recast his lead actress. But there may be more to it than that, as Theroux discovers one evening when he comes face to face with an ominous, eyebrowless cowboy, who speaks in riddles and hints of threats. "You will see me one more time if you do good," the cowboy says. "You'll see me two more times if you do bad." Nothing else really needs to be said. Mark Wahlberg's Dirk Diggler may be the most famous among the assembled talent in pornographer Jack Honrer's San Fernando Valley mansion/studio, but the flashiest is a fellow named Buck Swope, a genial African-American performer portrayed by Don Cheadle, who has a love for country music and a taste for gaudy rhinestone cowboy costumes. Swope's tastes change with the times, so it isn't long before he drops the urban cowboy shtick, but it haunts him later in the film when he accidentally steps into the middle of what might as well be a wild west holdup and shootout. Nothing at all is really out of place in this 1998 comedy from the Coen Brothers — it's set about a decade earlier, in a Los Angeles filled with assorted offbeat filmic types, including an aging hippie, a disturbed Vietnam vet, German nihilists, and a cordially poisonous pornographer. So perhaps it's no surprise that the film is narrated by a cowboy, played by none other than Sam Elliot, who occasionally actually intrudes on the movie to talk with its main character and chastise him for swearing. 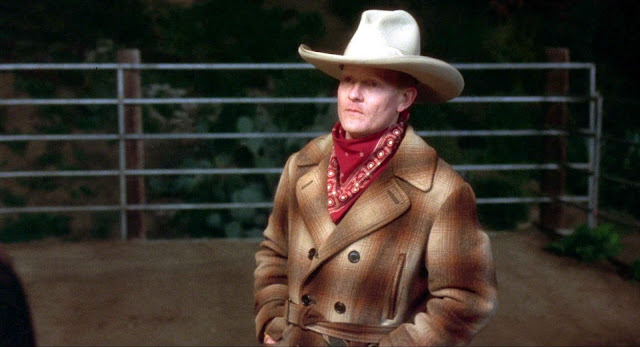 It's very likely the character Eli Cash in “The Royal Tannenbaums” is dressed like a cowboy to cover the fact that the actor who plays him, Owen Wilson, has a strong Texas accent, despite the fact that Cash is supposed to have been raised in New York. But director Wes Anderson and Wilson, who scripted the thing together, went ahead and made Cash much more than that. His story runs parallel to that of the moneyed and brilliant Tenenbaums, as he is in the process of emotionally deteriorating, as are his former neighbors, but Eli's story is especially strange. A former English teacher, he's struck it somewhat rich with an alternative universe Western novel in which Custer survived the massacre at Little Big Horn, and Eli has been blowing his meager profits on cowboy costumes and hard drugs. His decline is signaled by a television interview in which he is asked about an earlier novel, “Wildcat,” which failed. Eli explains the reason for its failure: "It was written in kind of an obsolete vernacular’ He then makes cougar noises, followed by the sounds of pistol shots, and walks out of the television studio. It's not exactly surprising to find characters dressed like cowboys in East Texas, where this 2002 film by Don Coscarelli is set. But the primary location for the film is a nursing home, and the home is a bit unusual, in that it contains both Elvis Presley and John F. Kennedy — maybe. Elvis, played by Bruce Campbell, may merely be a deluded impersonator, and JFK is played by African-American character actor Ossie Davis, who insists he was dyed brown in a conspiracy to conceal the fact that he survived his assassination attempt. Unquestionably, however, the nursing home is haunted, and by a very peculiar monster: An ancient mummy with a predilection for dressing in a 10-gallon hat and cowboy boots who hides in bathroom stalls scrawling filthy graffiti on the walls in hieroglyphs and who comes out at night to eat the souls of the elderly.